from 80 pcs. 0,27 EUR ea. from 160 pcs. 0,25 EUR ea. 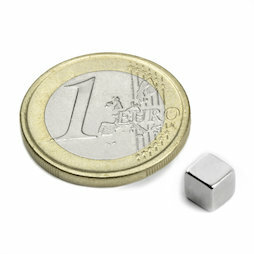 A small cube magnet with 5 mm edge length. Its adhesive force of 1 kg is astounding for such a small magnet. A perfect and extremely discreet fridge or whiteboard magnet - one of our top sellers for good reason. 5 pcs. 0,53 EUR ea. A perfect magnet to discreetly hang up notes and cards on magnetic boards. Michiel van Bekkum from Bilthoven transformed his refrigerator into a photo gallery using W-05-N cube magnets. This magnet works especially well on magnetic paint magnetic paint. You can use cube magnets and metal wire to create e.g. a beautiful photo wall, like in this customer application.